A friend of mine pointed this story out to me a couple of weeks ago… I’ve been pondering it, but I haven’t had a chance to write anything about it yet. 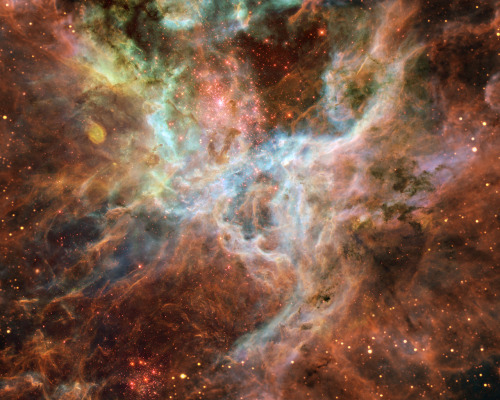 The biggest reason for this is the fact that it concerns the discovery of a star in the Tarantula Nebula with a current mass of 265 solar masses, and an estimated birth mass of up to 320 solar masses. Not just that, but apparently this is just the most massive of several gargantuan stars. This, frankly, is rather an audacious discovery, so I wanted to read through the paper to see what I thought of their work before passing and judgement. I haven’t had a chance to do that properly yet, but I certainly do still intend to. The fact is, I’m rather skeptical of this discovery. Stars this massive shouldn’t really exist according to accepted theories of the way stars form. A star weighing more than about 150 solar masses is above what’s known as the Eddington Limit. Basically, they’re so massive that they burn so much fuel so quickly that gravity can’t hold the star together. Such stars would blast themselves apart rapidly, losing mass until they could find a stable equillibrium. At least, according to theories. 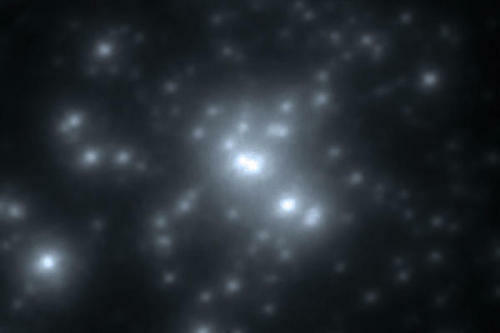 Even in the most massive star clusters known, such as the Arches Cluster near the core of the Milky Way, no stars have been found to be above the Eddington Limit. The star in question is a blue hypergiant known as R136a1, which lives amongst a cluster of other massive stars in the R136 cluster shown here. Several of these are apparently over Eddington’s Limit. A wolf-rayet star, it’s shedding mass at an alarming rate, as would be expected for a very massive ageing star. But is it shedding mass rapidly enough to allow for it’s huge estimated mass? And how could such a massive star even form to begin with? The reason I’m skeptical is that I’ve seen a couple of other similar news stories come up in the past. Stories about the discovery of massive stars which “cause scientists to question theories of star formation.” Such monster stars in the past have included Pismis 24-1 and the Pistol Star. In these and other cases, on further inspection, it’s been found that the star was of a mass close to, but not above the Eddington Limit. No star has ever been found to break Eddington’s rules, and as much as Eddington himself might have appreciated the idea that his rules could one day be broken, I feel that some doubt should be reserved until this is confirmed. I’d caution placing full significance on this discovery until it’s been confirmed. Of course, there’s a good chance I could be wrong. I frequently am. But challenging each others’ ideas as well as our own is a big part of how science progresses. I also haven’t fully read through the work of the astronomers who undertook all of this, and certainly wouldn’t want to belittle their findings. Instead, I’m going to await other astronomers to try and confirm or disprove their discovery. If they’re right and this really is the first star discovered to exist above the Eddington Limit, then something fascinating must be going on in the Tarantula Nebula. Something very fascinating indeed. The paper, The R136 star cluster hosts several stars whose individual masses greatly exceed the accepted 150 Msun stellar mass limit, is available to download on arXiv. Bottom: HST mosaic – NASA/ESA/Danny LaCrue.